BIRD The troubled life and career of the jazz musician, Charlie "Bird" Parker. Director: Clint Eastwood Writer: Joel Oliansky Stars: Forest Whitaker, Diane Venora and Michael Zelniker The year: 1946. The event: Oakland's "Jazz at the Philharmonic." The music streaked into the unknown, daring listeners to grab hold and fly there, too. On stage was the creator of those new sounds: Charles "Yardbird" Parker. In the crowd was the 16-year-old who would someday bring Parker's extraordinary story to the screen: Clint Eastwood. "Americans don't have any original art except Western movies and jazz," observes Eastwood. Movie fans, of course, know that few heroes sit as tall in the saddles as Eastwood. Now the legendary America icon, whose Dirty Harry films have been praised for their jazz scores, ventures deeper into that other original American art. 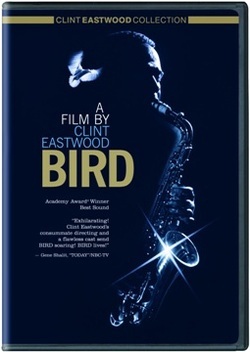 Eastwood produces and directs Bird, a film burnished with the magic of that 1946 concert encounter between legend and future legend and honored with an Academy Award for Best Sound in its spellbinding recreation of a man and his music. Like jazz itself, Bird rings with counterpoints and embellishments. Past and future overlap as the film explores Yardbird's soaring skill and destructive excesses.